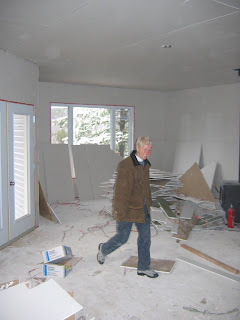 Cottage on the Edge - the DIY Cottage Blog: Drywall Installation: First Stage is complete! Drywall Installation: First Stage is complete! We we up on the weekend to pay the drywall contractor for the first stage of his work - the installation of the drywall board. It was a great feeling and a sense of another milestone passing - that is having the drywall installed. Even though it was not yet finished - no taping or plastering yet - we got a a first real sense of what the interior of the cottage would look and feel like. I have been playing around with he video function on my camera, so I hope to have a video of the cottage in an upcoming post.